Have you ever wondered what your local intersection might have looked like in 1900? What about 1920? 1950? What has changed? What has stayed the same? A wonderful new site that we learned about at the Great Lake’s THAT Camp at Michigan State University was lookbackmaps, which makes historical imagery accessible to enthusiasts through a fascinating and accessible website. 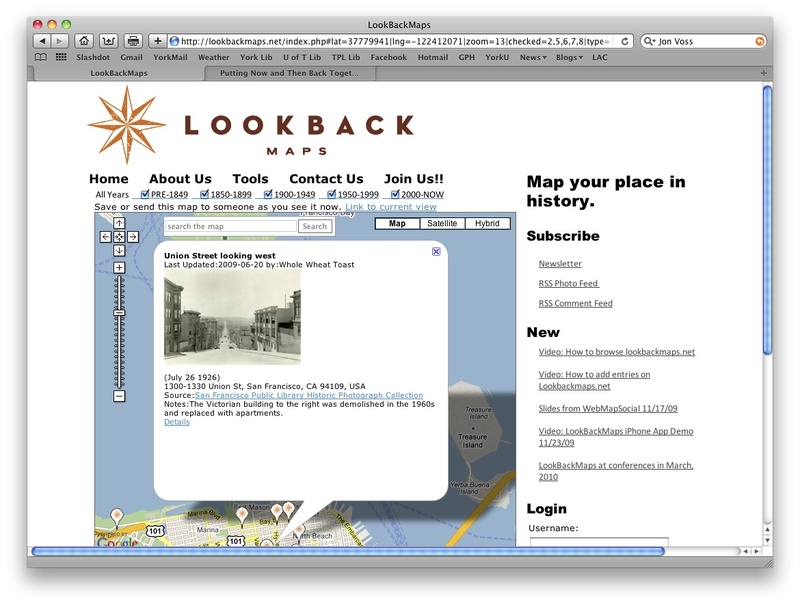 Using google maps, lookbackmaps allows users to not only click on a location and see a current photograph juxtaposed against a historical one, but also to upload their own entries into the system. Right now there is a marked focus on San Francisco, where founder Jon Voss is situated, but it is spreading across the United States and hopefully soon even into Canada! It also has an iPhone application that allows you to phase the historical imagery into your screencapture – augmented reality for historians! Check out a video demo here. What a remarkable way to engage in a historical manner with your surroundings! Historical photographs are aggregated from a variety of places: personal collections, university archives, municipal archives, railroad enthusiasts, the list goes on. An important message that comes out of this is the importance of moving beyond silos of knowledge. It’s wonderful that the City of Toronto has a great collection of photographs, as does the Clara Thomas Archives & Special Collections at York University – but a site like this can bring them together and make them accessible to the general public in an engaging manner. Another project is SepiaTown, which also seeks to aggregate historical photographs in a variety of places – currently featured is New York, London, San Francisco, Paris, Boston, Moscow, Los Angeles, and Amsterdam. When you click on an image, you’re brought to a better quality version of it (which might be drawn from a personal collection of the New York Public Library), along with a representation of where you’re standing. You can even see the google streetview juxtaposed with the past image. In Toronto, a similar project has been running over on Torontoist.com. A great example of this can be seen here. A historical image is combined with a current-day photograph to vividly show how it has changed over time – for example, at Yonge and Queen we see the historic Yonge St. streetcar line below, rambling beneath the skyscrapers that now exist. What a way to show how vividly things have changed, without having to dig through the archival search engines yourself. If I sound excited, that’s because I am. Are there any projects that come to mind that have done this sort of work with space and image? If so, I’d love to hear about them. Thanks for posting this Ian! I think it’s great to see all of the ways history is coming to life in our mashup culture. It seems like there is a natural curiosity to learn what and who was here before us, and as more and more technological tools become available to visualize the past, my hope is that we’ll continue to see more and more mashups like the ones you’ve featured here. One important distinction of LookBackMaps is that we don’t actually facilitate uploads, only links to exiting photos. One reason is copyright concern, and another is scalability, as we hope to keep the site lean and server costs low. The question of uploading images is an important one in designing this kind of project, and there are pros and cons for both. Of course, the server question is crucially important, and I think you’ve found an awesome way around the copyright and logistical problems! Wow, Brenton, that’s amazing. To see the impact that the wall had on the city, especially in the second photograph, is astounding. Thanks for the link!